Waiheke Water has taken home several awards at the ‘Oscars’ of water, beating hundreds of entries from around the world and walking away as the most awarded company of the competition. Managing Director and Founder Jesse Ball is delighted with the recognition and believes the win demonstrates the high quality and purity of Waiheke Water. The awards are also a reflection of the hard work and dedication of a company that has rebuilt its plant after being levelled by a devastating flood in March 2017. 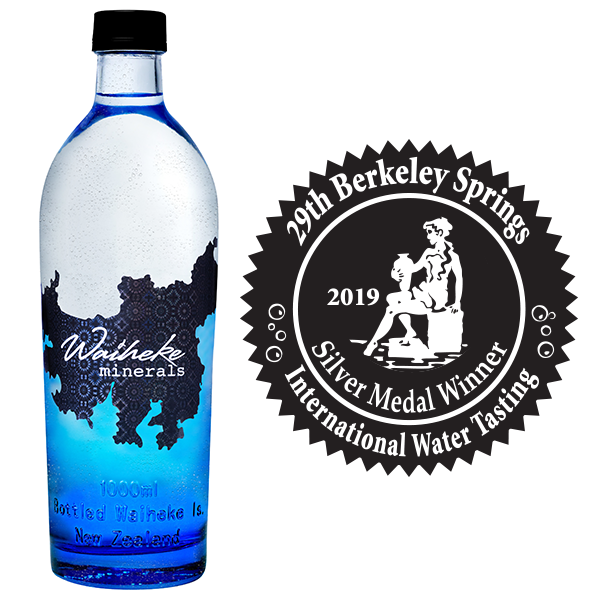 The packaging category in which Waiheke Water received a silver for Waiheke (Sparkling) Minerals, had 16 entrants, the most ever in the competition’s 29 year history. The bespoke glass bottles, featuring the coordinates of the water source and the shape of Waiheke Island on the base, were designed by Jesse. Judging for the competition included looking, sniffing and tasting each water under guidelines similar to those in a wine tasting. The waters were rated for each attribute including appearance (it should be clear – or slightly opaque for glacial waters), aroma (there should be none), taste (it should taste clean), mouth feel (it should feel light), aftertaste (it should leave you thirsty for more). The community of Waiheke Island is reliant on supplied bulk water, particularly during the summer months. When founder Jesse Ball acquired one of the water businesses in 2015, he spent time researching and analysing the properties of the water and soon discovered its potential to raise the bar in the New Zealand water market. Selected specialty stores and restaurants on the Island. New World Birkenhead, Milford, Remuera and Devonport stores.